OLD DAYS: This postcard was a boast about the clarity of Silver Springs. BATHING BEAUTY: A mid-20th-century invitation to Silver Springs. OLD TIME FUN: Feeding the fish and 'gators over the side of a glass-bottom boat. With fewer and fewer tourists ringing its cash registers and encroaching pollution clouding its trademark crystalline waters, Florida's oldest tourist draw, Silver Springs, is going out of business. But it will not disappear. On Wednesday, Gov. Rick Scott and the Florida Cabinet agreed to release the Marion County attraction's operators from its lease so that Silver Springs can become a state park. 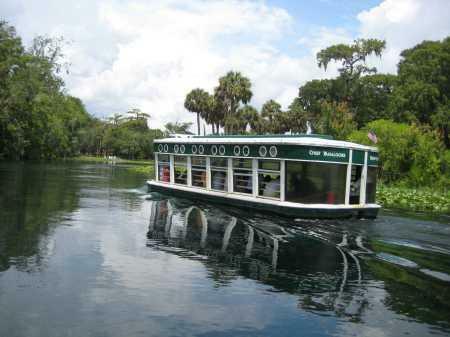 MAIN ATTRACTION: For more than a century, tourists came to Silver Springs to cruise the eerily clear Silver River in boats with glass bottoms. Instead of having to stick it out for 16 more years, Festival Fun Parks will be released from its obligations in September. It's been more than 140 years since an entrepreneur named Phillip Morrell acquired a newly-invented glass-bottom boat and began selling rides on the springs so Florida visitors could see the wildlife and ancient fossils beneath the surface. For years, tourists flocked to the clear waters, the boat rides and the natural Florida setting. But as tourist appetites changed, Silver Springs gradually added wildlife exhibits, theme park rides and gift shops. Purists began to complain about Silver Springs' descent into tourist-trap kitsch. Meanwhile, the animals were contributing substantially to the water pollution problem. Silver Springs never fully recovered. "Silver Springs has and always will be part of the identity of Marion County and ... created an iconic brand that is still recognized today," County Commissioner Stan McClain said of the springs, considered Florida's first tourist attraction, whose identity as such dates to the 1870s. Yet, he added, more recently visitors have left "filled with disappointment" with their experience, lamenting especially the decline in clarity and quality of the once crystal clear waters. The "decline" is attributed to nitrate pollution and, reportedly, there's a plan to clear it up once the springs are in state hands. The attraction where at least two dozen movies, including a Tarzan series, The Creature From the Black Lagoon and the James Bond films Thunderball, Moonraker and Never Say Never Again were filmed during the last century will become part of nearby Silver River State Park.